Luke Wells hit a career best 258 for Sussex at Hove on Monday as he and Stiaan van Zyl put on 376 for the third wicket against Durham. Wells, 26, missed Sussex’s opening two matches of the season with a knee injury. He returned for the one-day game against South Africa on Friday and was out first ball. This was his first championship innings for eight months. Best known for his application and crease occupation, Wells is not usually associated with a more famous left-hander, the West Indian Brian Lara. But that was the case here as he and Stiaan van Zyl beat the previous third wicket record against Durham, 314 between Lara and Trevor Penney, when Lara went on to make 501 on that occasion. Luke’s father, Alan, who won a solitary Test cap in 1995, was probably a more stylish player. And his uncle, Colin, who played in two ODIs, was naturally more aggressive. 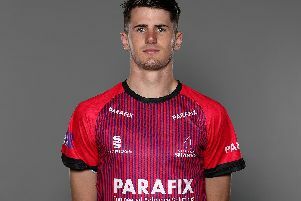 But the younger version of Wells, who does not feature in white-ball cricket for Sussex, showed that once in he can hit the ball as cleanly as anyone in the side. In an innings of increasing violence, which occupied 311 deliveries, he hit 34 fours and seven sixes. He didn’t hit a maximum in his 165-ball century. But, as he approached his double hundred, he hit Chris Rushworth –Durham’s best bowler – over long-leg for six. He then steered James Weighhell to third man for four to reach his 200 before flicking the bowler’s next delivery over midwicket for another six. But van Zyl was also admirable, reaching his 22nd first-class century from 205 balls. For the most part he was the foil for Wells. But his class reminded everyone that he is the winner of 12 Test caps for South Africa. At the close he was 141 not out in a Sussex total of 452 for four. Durham, who did not have their usual depth of bowling, were without Graham Onions for the last two sessions, and most of the first. His fitness was being “assessed” by Durham, who fielded seven bowlers in the day. It looked ominous for Sussex when they resumed on 43 for one. Chris Nash was out to the fourth ball of the morning – having been put down in the slips earlier in the Onions over – without adding to his overnight 22. But then Wells and van Zyl turned the innings on its head.